According to the National Institute of Mental Health (NIMH), about 18 percent of adults in the United States suffer with some form of anxiety, and nearly 23 percent of those suffer with what are considered to be severe cases. A quarter of U.S. teens also have anxiety disorders, according to the NIMH. Women are 60 percent more likely to develop some form of anxiety in their lifetime, particularly between the ages of 30 and 44. There are benefits to all this conversation around anxiety: we have a better understanding of what anxiety is and as a result we may be able to understand and empathize with those who are struggling better. It’s important to be careful that we don’t pathologize all anxiety, and that we don’t lose sight of the strength that exists in those who truly do have anxiety disorders. To better understand what type of anxiety you may be struggling with I have included the following link. The way we talk about anxiety today, it is easy to believe that all anxiety is inherently bad and forget that it’s our natural response to threat or danger. We actually need anxiety to survive; it prepares our body to respond appropriately in the face of danger. However, our physiological experience of anxiety developed back when the regular dangers humans faced included running from large, sharp-toothed predators. So when we are experiencing the fight-or-flight response before a big exam or presentation, it may not feel particularly adaptive. But despite the discomfort that comes with anxiety, it is natural when it is experienced as the result of a particular situation or problem, when it is proportional to the stressor, and when it only lasts until the situation is resolved (ULifeline, 2016). Anxiety, though often painful, is an important and adaptive part of the human experience. In the midst of this struggle, it’s important to remember that anxiety doesn’t have to own you. It may be a part of you, and it may influence your life in various and profound ways. But anxiety does not determine who you are. A diagnosis does not define you. You are not a disorder. You are not weak, powerless, or alone. Acknowledging the pain anxiety can bring is so important, but it can also be helpful to recognize that struggling with anxiety may also foster certain strengths. 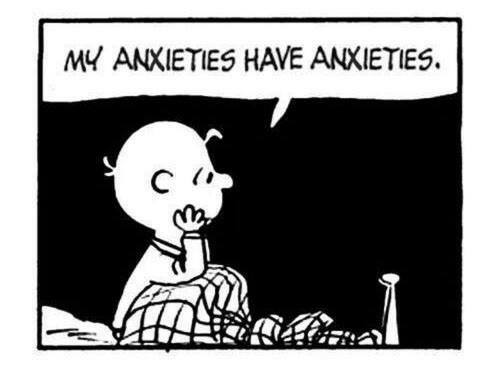 According to Dr. Tracy Foose (2013), trait anxiety is associated with being “highly conscientious, honest, detail oriented, performance driven, socially responsible, [and] self-controlled.” Furthermore, learning to cope with anxiety can push us towards an increased self-awareness and knowledge of ourselves. Because it is so uncomfortable, it can motivate us to grow and change parts of ourselves or our lives that may not be serving us. Once we learn that we can move through the discomfort of anxiety, we often feel stronger and more confident in ourselves knowing that we have the fortitude to move through something so profoundly difficult (Sutherland, 2011). Finally, if you do feel like anxiety is controlling your life, you don’t have to stay stuck in this space. Not only can anxiety teach you to embrace vulnerability and reach out for support from loved ones, but therapy offers very effective treatment. Cognitive Behavioral Therapy and Acceptance and Commitment Therapy can teach valuable coping skills, and can help to change your relationship to anxiety. Nothing will ever take anxiety away completely, but we wouldn’t want that because without anxiety, we wouldn’t be able to survive. Therapy can help us learn that even in the worst throws of anxiety, we will survive, and may even thrive. Please view my website MegCanHelp.com to learn more about my psychological services.